On Ie Shima you can expect the most exciting wall diving on the island. Several sites offer perfectly vertical walls that are completely festooned with sea fans and cactus coral growing out from the walls. At Wajii you will enjoy viewing the second largest brain coral in the world. Over at Ohoba drop off you will get to explore a pinnacle rising vertically from more than 130 feet of water and then flattening off at 30 feet. 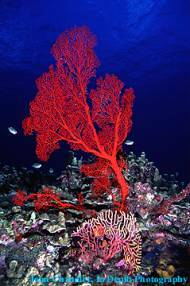 This seamount is home to an amazingly photogenic collection of lionfish, sea fans, scorpion fish, and soft coral. All of these wonderful adornments make this one of the most colorful dives in the Okinawan archipelago. On the calm flat days of winter and summer I am usually trying my best to find a boat captain that will take me out there. Why do I travel so far away? This visibility is always impressive and the coral reefs are without equal throughout Okinawa. Real clownfish, Unicorn fish, barracuda (friendly ones of course) Sting Rays, and large Napoleon Wrasse are the stars of the reef here. As a photographer I am always drawn to the drama of photographing a diver swimming alongside a sea fan that often times will be as large as my model. This is a great area for diving and exploration. How to get there: While many experienced divers will tell you that both Wajii and Ohoba are accessible from shore I do not recommend that you attempt shore diving these sites. You can drive to both sites but first you have to get your car on the ferry at Motobu and across the channel to Ie Shima's port. Then you have to drive around the island to the Marine Corps Base Training area and gain access to the base training area. Following that you have to find your way down to the dive sites. Now all of this has to be accomplished on days when the water is absolutely flat. Otherwise forget it. I prefer using a boat. The cost of the ferry will defer the cost of two divers on a boat dive (¥6000 each). The boat captain, guided by an experienced instructor or divemaster, can take you directly to the sites. The entry from the deck of the boat sure beats the long walk across the reef. The only English Speaking dive shop booking dive trips to Ie Shima is FATHOMS. Contact Rich at www.fathoms.net or call at 090 8766 0868. Rich can schedule a dive trip for you at your leisure any day of the week. You can also contact Kadena Marina as well at 634 6344 and ask if they are scheduling any trips to Ie Shima. Site Location: Ohoba, my favorite site, is located on the Northwestern tip of the island. Diving here is limited to those days when the wind is slack and there are absolutely no wind driven waves coming from the north. Wajii my favorite second dive is just about 2000 yards south of Ohoba and is also on the western coast of Ie Shima. This is best marked by the pump house that sets adjacent to the shore entry site and sets at the end of a roadway just beneath the Marine Corps Base Training Area. Other activities: During summer when the sun is high overhead and penetrating its deepest, the underwater photographer can use the blue azure reflection as the perfect backdrop for those buddy shots silhouetted against the surface. If you are going and want directions just contact me at on my website Chandler See you at the dock. I will be the bald guy trying to hitch a ride to the Ie Shima!